I just got a laptop Compaq Presario CQ42 which running Core i5 processor with ATI Radeon HD5430 (3D Graphic Card). 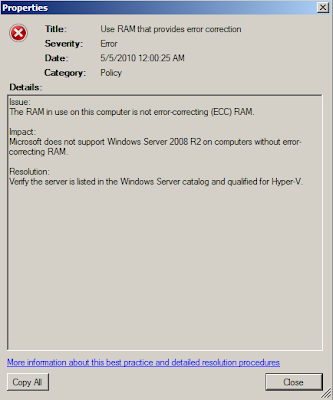 With 4 vCPU which showing in Task Manager (Duo core 2 with Hyper Threading enabled) was fantastic but when you install Hyper V, it will cause issue such as BDOD or slow performance. 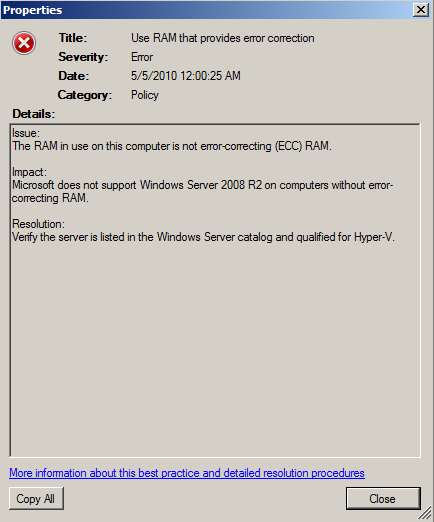 Still got BSOD error message telling about Video Graphic card driver issue. In order to solve this issue, i use Standard VGA driver to run Hyper V. A bit dissapointed but what's the heck as long i can run Hyper V in the laptop. Still unsatisfied, so i decided to looking around using Google. 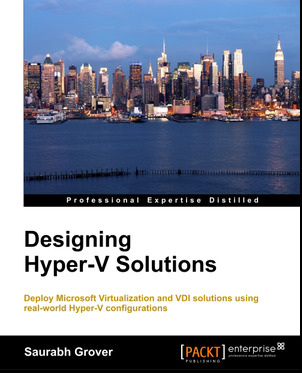 i have found an article written by Ben Armstrong, Virtualization Program Manager (http://blogs.msdn.com/b/virtual_pc_guy/archive/2009/11/16/understanding-high-end-video-performance-issues-with-hyper-v.aspx) which discuss about this issue. Besides BSOD, it will also give slow performance issue if you manage to install the driver. For more detail, please refer to http://support.microsoft.com/kb/961661 . 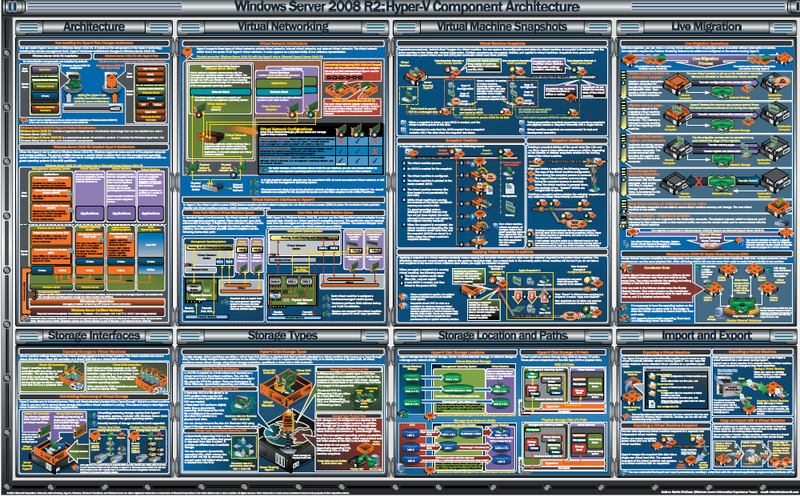 Long awaited poster about Virtualization. 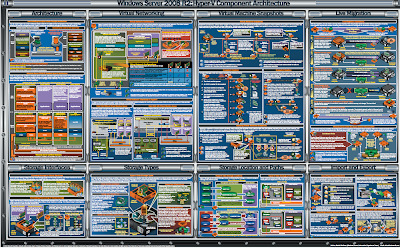 This poster provides a visual reference for understanding key Hyper-V technologies in Windows Server 2008 R2. 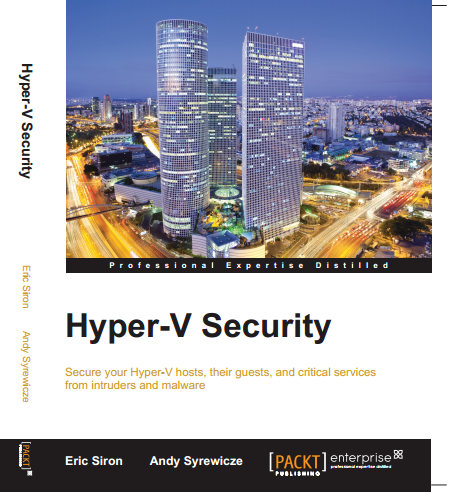 It focuses on architecture, snapshots, live migration, virtual networking, storage, and import/export. The MS IT Pro: Virtualization Administrator is official available. For more detail, please check this out. 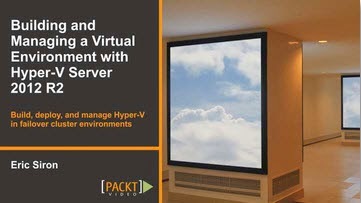 Continue from Part 1:- http://www.ms4u.info/2010/05/experience-on-hyper-v-r2-cluster-with.html . 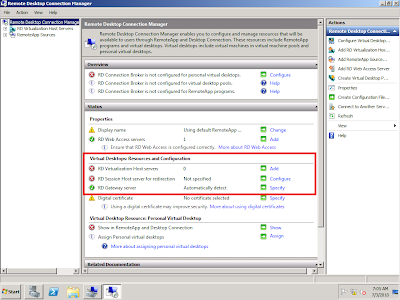 Hit to a problem "Cannot detect a disk when adding Storage from Failover Cluster" and test result from Validate a Configuration failed as well. Eventhough LUN has presented to host and appear in Computer Management snap-in. I almost faint and worry that MD3000 cannot support for Windows Clustering. Then i decided to search using Google. Guess what i found, most article mentioned that MD3000 is not supported for Clustering but luckly MD3000 support matrix mention otherwise. 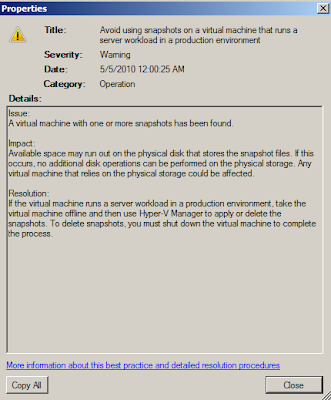 For those who are not familar with the Windows Server 2008 Clustering, you may want to take note about one important requirement. 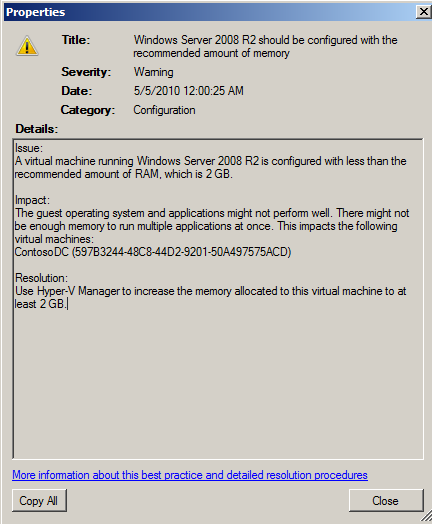 One of the Windows Server 2008 Clustering requirement is SCSI 3 Persistent Reservation. This requirement is very important and you should take note of it. 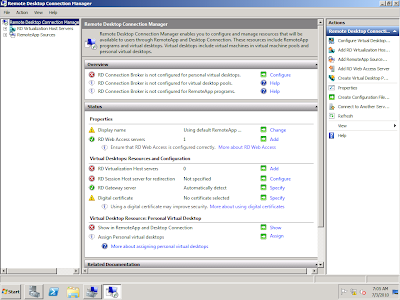 Before you configure Failover Cluster for Hyper V, you should run Validate a configuration and perform all test. The test will check for configuration and SCSI 3 persistent reservation. 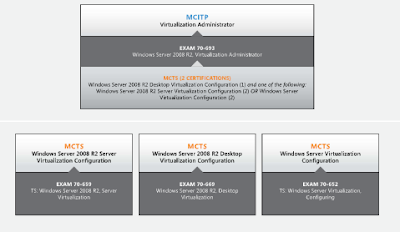 MD3000 is supported on Windows Server 2008 R2. All you need to do is make sure the MD3000 firmware is running Second Generation. The most important is "MD3000 is SCSI 3 Persistent Reservation Certified !" 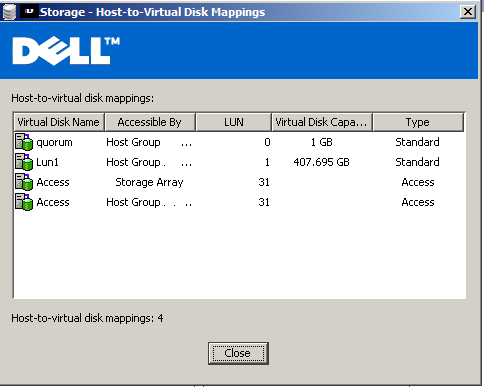 1.On the disk access, the Virtual Disk created should set to Host Group rather than individual host. 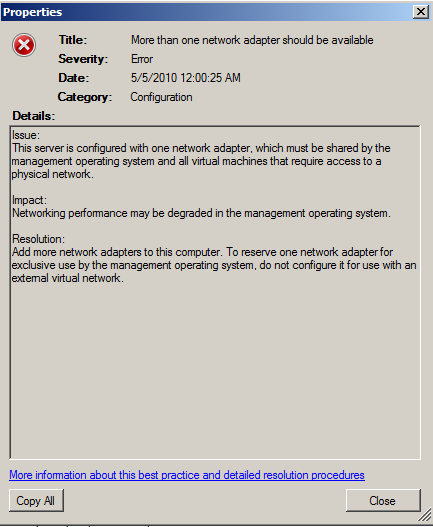 2.On the Dell Disk Manager Console, make sure the type of host that you set is Windows Server 2003/2008 Cluster". If you have mistaken added the type to 'Windows Server 2003/2008 Non Cluster", just click on Modify tab > Edit Host Topology. 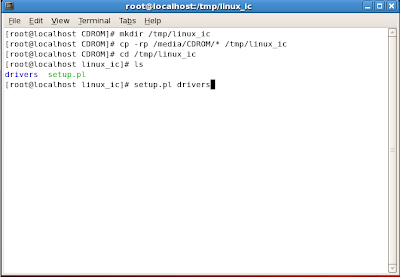 Select a host and click Change on the Host Type. After perform this setting, make sure you restart all cluster node. Once you've done that, you can re-run the Validate a Configuration test. This time, the test will passed and you can add a disk by using Failover Cluster. Then you can start to setup Failover Cluster. 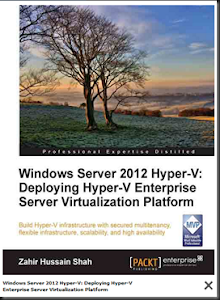 http://www.ms4u.info/2010/03/video-building-failover-cluster-and.html . (Ignore the iSCSI connection as MD3000 is using SAS cable connection). 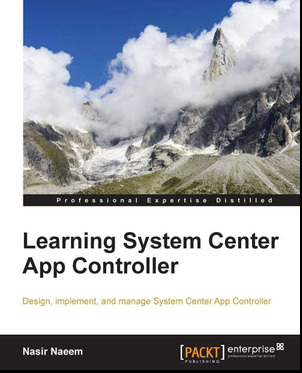 The LUN presented to host will appear in Computer Management. 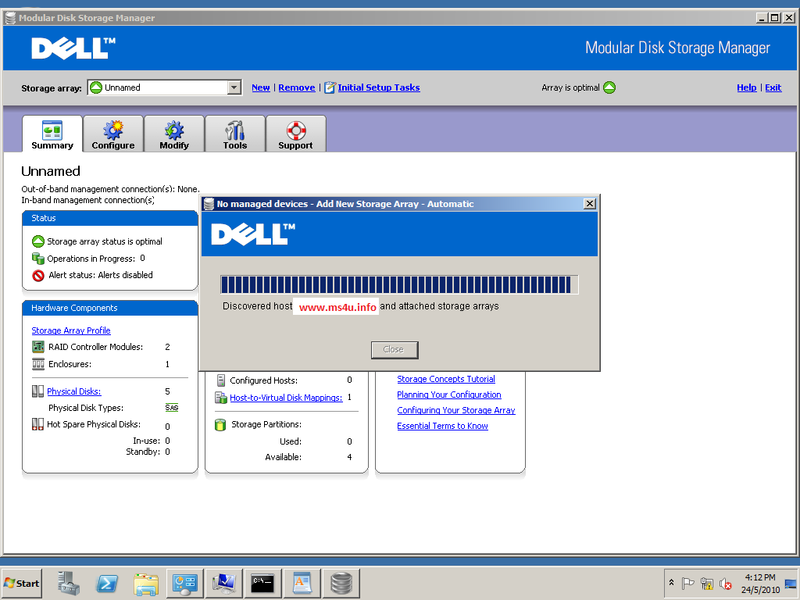 Lastly i have created several Virtual Machine using Fixed disk and perform Live migration. It work and not bad in term of performance. For those who're interested to try Hyper V with Failover Cluster but with limited budget, give Dell PowerVault MD3000 a try. Well, it's not my style to blog about storage as the concept of storage is about the same. 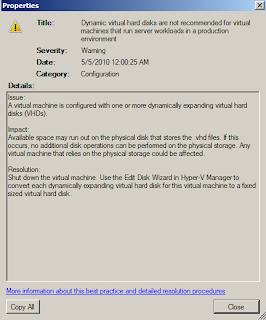 Why make this so special since i have play around with Dell EqualLogic, HP Lefthand, Compellent and Windows Storage Server 2008 for Hyper V Cluster? If you realise, most storage brand that i mentioned above is iSCSI storage. Finally after waiting for almost 3 hours which they fail to configure the storage, i have decided to get my hand dirty by start pick up a phone and talk to engineer who're well verse with MD3000 configuration. 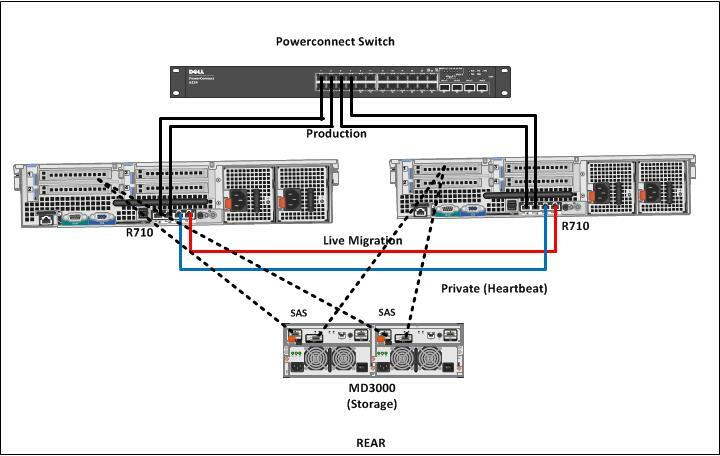 To start with, MD3000 is using direct attached SAS cable (2 meter) and it require HBA card to be present on the server. The Storage came with Dual controller and each HBA card has dual port. Refer to below on how i plug the SAS cable. The connection to the storage is 3 GBps for each cable. With 2 cables which connect to dual controller, give me around 6GBps speed. That's quite fast compare to iSCSI connection which limited to 1GBps. 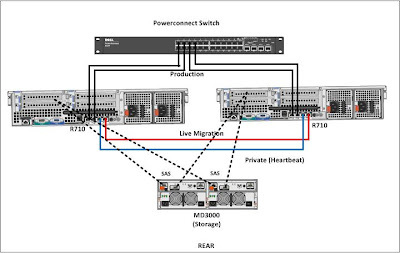 However MD3000 is limited to up to 4 hosts depend on firmware that you loaded in. 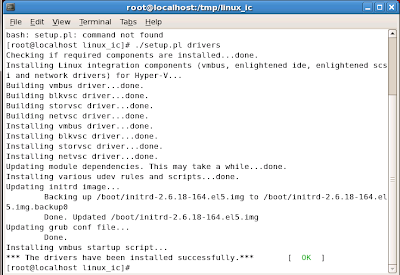 1st version firmware is limited to 2 hosts. 2nd version of firmware allow up to 4 hosts. The storage consist of 15 slot for SAS/SATA drive. It is not recommended to combine SAS and SATA together. For those of you who're deciding to purchase this storage for small scale Hyper V Cluster, i recommend that you buy SAS- 15rpm disk. Remember to allocate 1 disk for spare which most people did not bother to include. It come in handy especially you configure RAID 5. With a hot spare, at least you can have 2 disks fail at a time. 3. Plug in Management CAT5 cable. The default ip is 192.168.128.101 and 192.168.128.102 (2 IP because 2 Dual controller in the MD3000). It is not necessary to use management CAT 5. You can skip this step and proceed to Step 4. Not quite straight forward compare to HP. If you know where to locate, please let me know. 7. No need to install SAS HBA card driver. 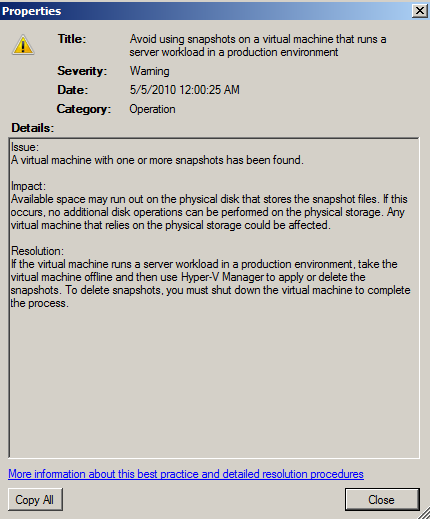 Windows Server 2008 R2 has the driver for it. 8. 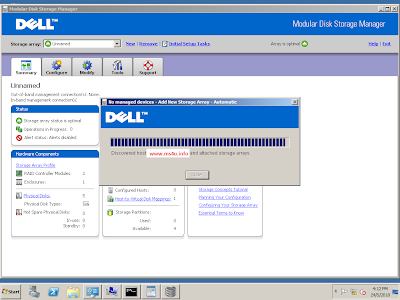 Using the CD provided, install Dell Storage Manager. 9. 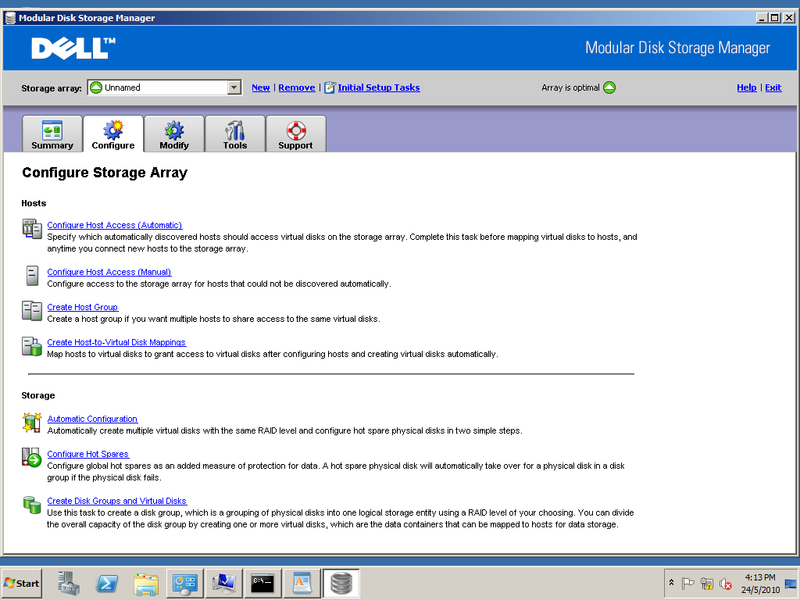 Run Modular Disk Storage Manager Client which available on your Start menu. 10.It will start to discover the host. 11. 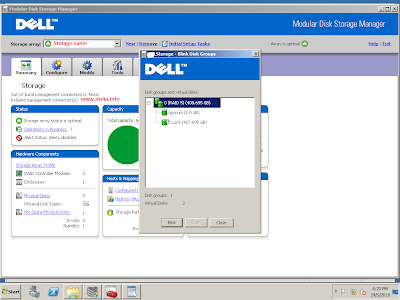 By using Dell Disk Storage Manager, you're using in-band management. If you use management LAN, you're connected as out-band management. Either way also working fine. 12. Click on Configure tab. 13. 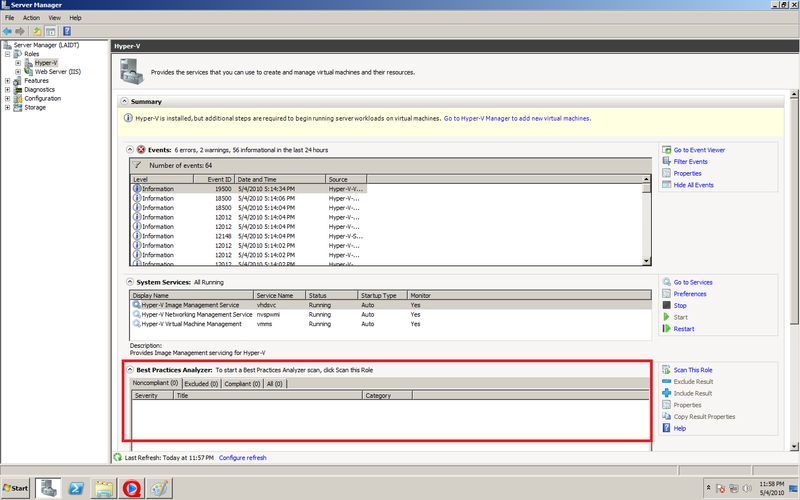 Select Configure Host Access (Manual) first. 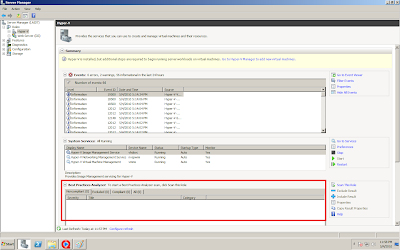 Test select Configure Host Access (Automatics) but fail to discover the host. Once you select Manual, you need to key in the server name and select the HBA port number. Here you will see , 2 HBA unique port number . (sometime we called it WWW name). If you did not shutdown the 2nd server, you will see 4 HBA port number. Then, you will feel confuse just as i'm. (start asking question, which refer to the correct host). Once you have added the HBA to 1st Host, then you can ON the 2nd server. Repeat the same process and add both to a host group. 14. 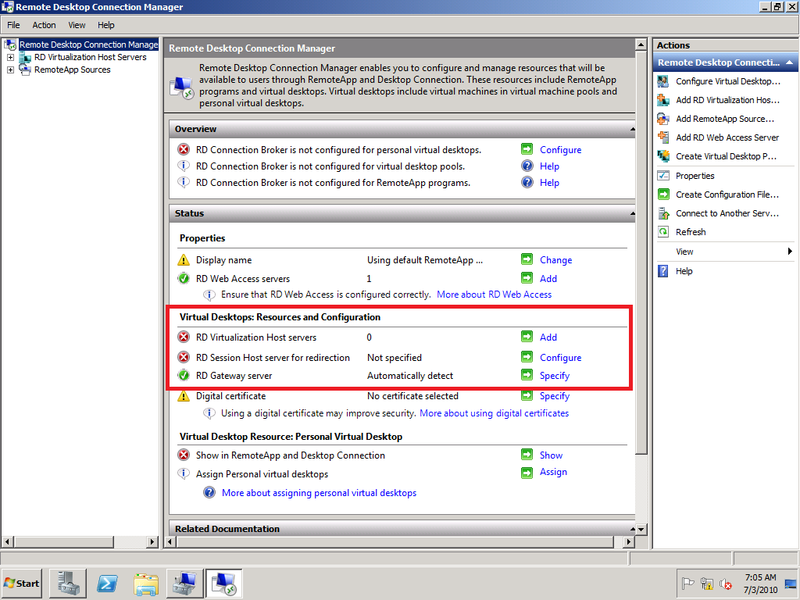 Click Create Disk Group and Virtual Disk on the Configure tab. 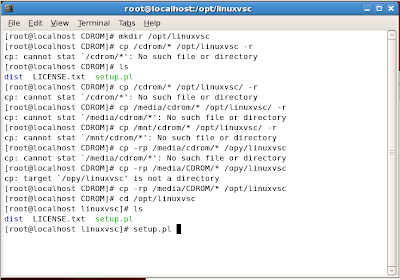 This is where you group your disk and configure LUN. For my configuration, i have configured 1 Disk Group and 2 Virtual Disk. 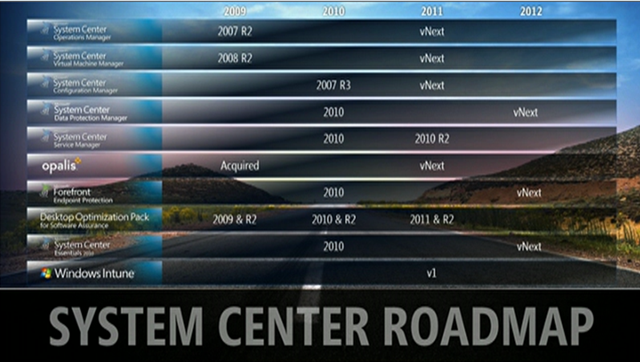 1st Virtual Disk is allocate 1GB for quorum and 2nd Virtual Disk allocate 400GB for VHD. 16. On the front page, click on Disk to view the result of the disk that you've configure. 17. I got 2 LUN and currently the 400GB is still initializing. 18. If you go to server Computer Management snap in, you can now detect both LUN present. I have formatted quorum disk and then make it offline. 19. 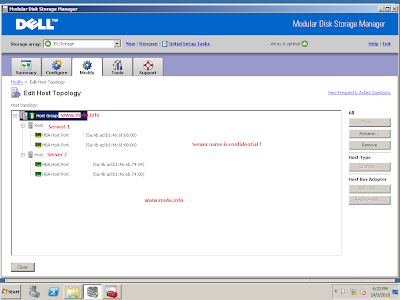 You need to wait until the Disk initialize complete on Disk Storage Manager before format the second LUN. Quite straight forward and you can easily navigate the tool. Let see how it go tomorrow. 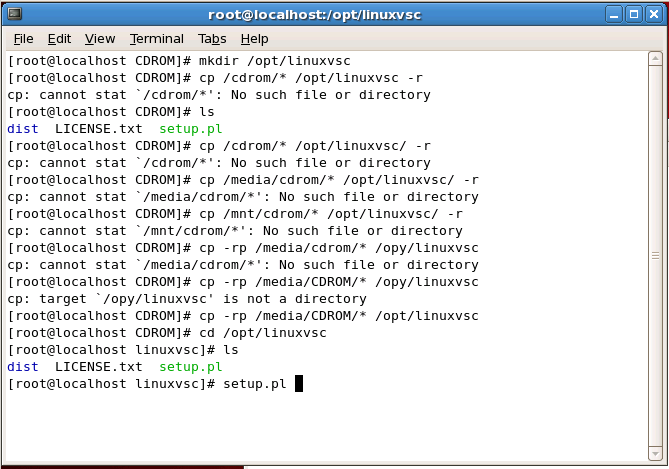 Sorry, can't get all the step by step snapshot of the configuration. But don't worry just follow the step 1- 19 , then you're fine. 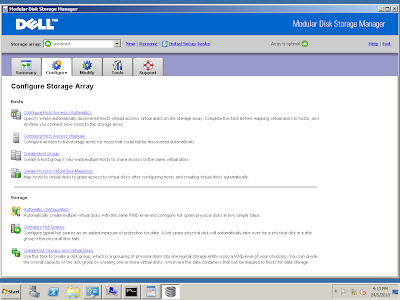 Just a reminder, make sure you install Disk Storage Manager software- Typical / Full installation on both servers. 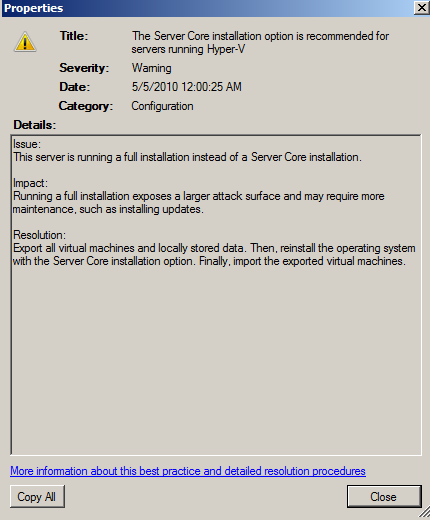 Will continue on part 2 to check the status, performance and configuration on Hyper V Failover Cluster. A bit late to talk about this topic. Anyway, technology is never too late to learn. 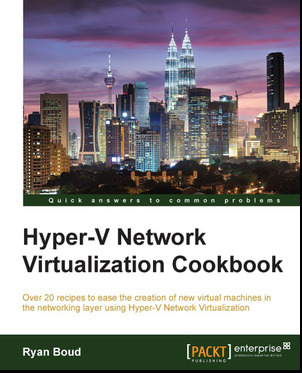 Well, when we do virtualization, we often need to do planning. 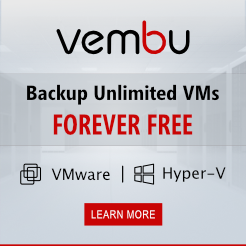 You can use this tool to do planning for memory for a stand alone Hyper V host. 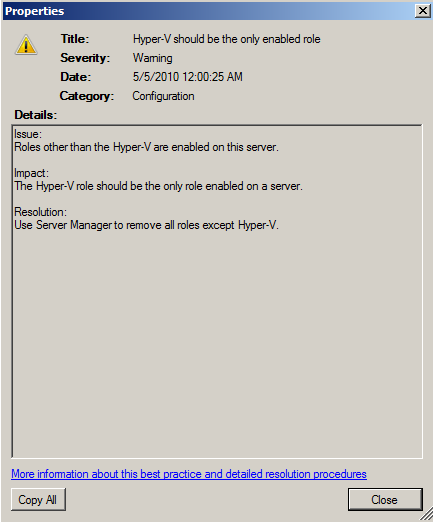 Then you start to think, how about Cluster Hyper V host. Well, good news!. Thanks to Aidan Finn, he has wrote a Hyper V Calculator version 2 (which i personally called it). The new spreadsheet covered RAM, disk, clustering and CPU. On Version 2, fill up those value which highlight in "Yellow". Interested. Get both tools from my SkyDrive. Continue from Part 4. 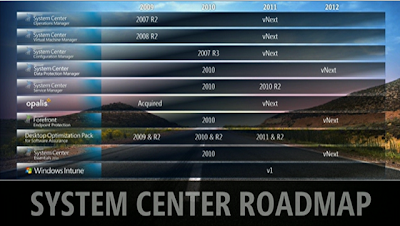 This part will focus on RD Broker Configuration. 1. Log on to RDSBroker VM with administrative rights. 2. 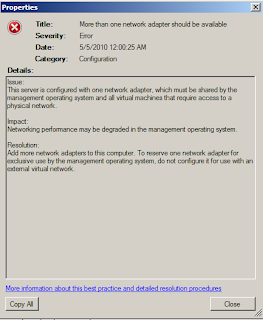 Open Computer Management. Click on Start > Administrative Tools > Computer Management. 8. 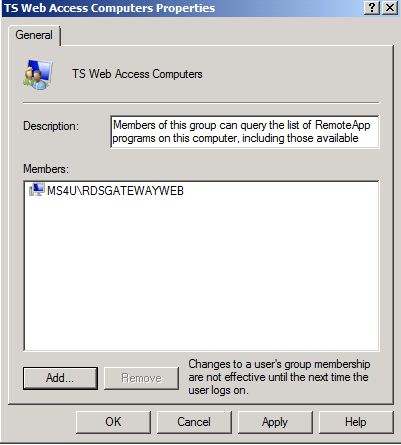 Click OK to close the TS Web Access computer properties. 2. Open Remote Desktop Session Host Configuration snap in. 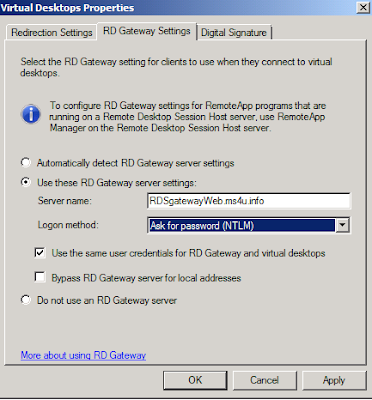 Click Start > Administrative Tools > Remote Desktop Services > Remote desktop Connection Manager. 4.Enter RDSVH.ms4u.info and click Add. 5. 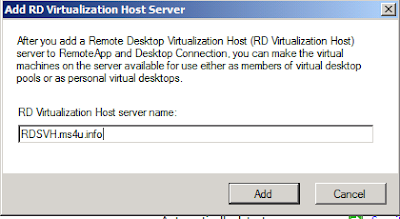 In the middle pane under Virtual desktops Resource and configuration, locate RD Session Host server for redirection and click configure. 6. 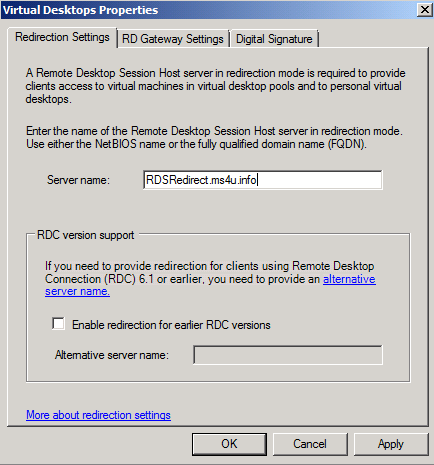 On the redirection setting tab, enter server name:- RDSRedirect.ms4u.info (Enter FQDN) and click OK button. 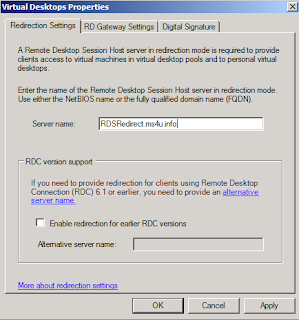 Click here for Part 6:- Building VDI using Remote Desktop Services (RDS) I will cover on how to create Personal Desktop Pool. Thank to Kwan (MVP: SCOM:- http://systemcenterblog.blogspot.com/ ) for sharing some screen shot which i did not included in my last article. I have added some screen shot which contributed by Kwan. 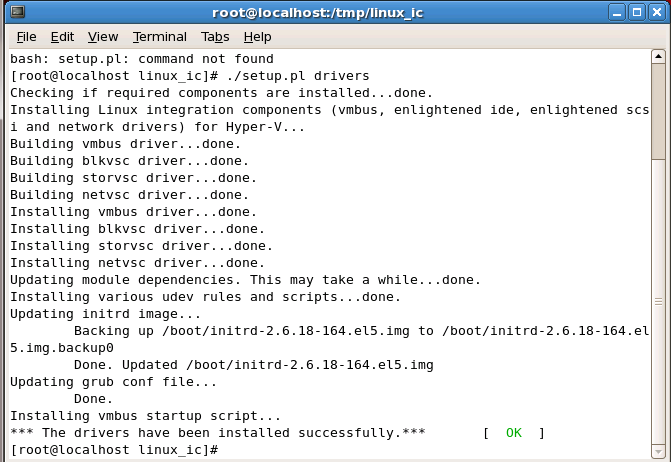 Two days ago, Microsoft announces the availability of the RC release of the Linux Integration Services v2.1. This new version includes new functionality, including timesync, integrated shutdown, and SMP support. 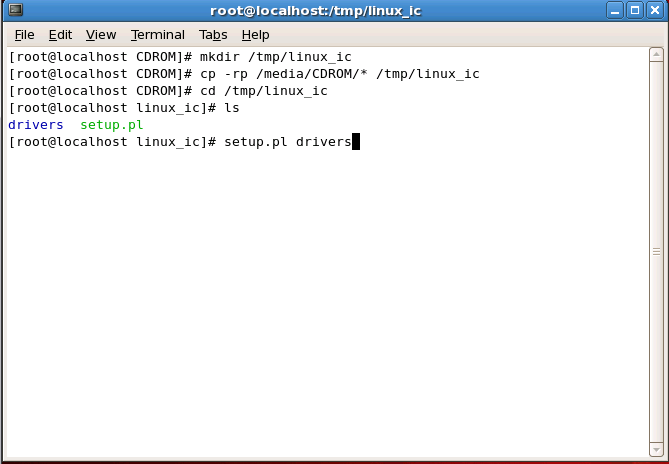 I have tested this tool on Red Hat Enterprise Linux 5.4. 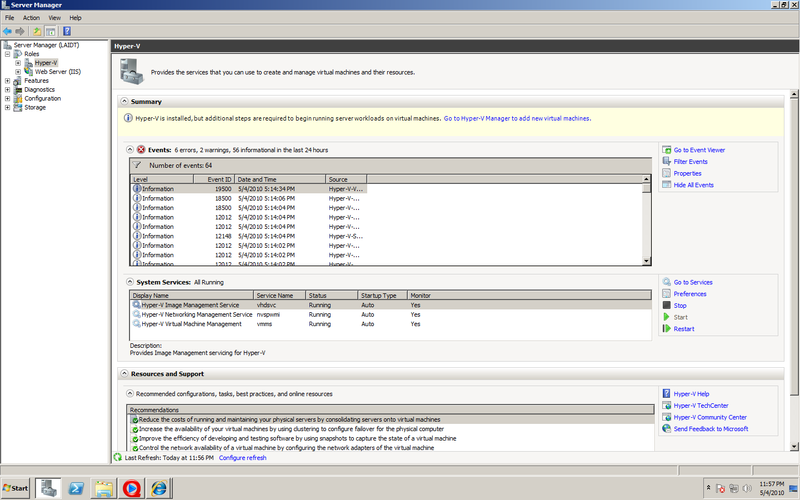 Work fine and i can assign 4 vCPU and execute Integrated Shutdown from the Hyper V Console for this operating system. 3. 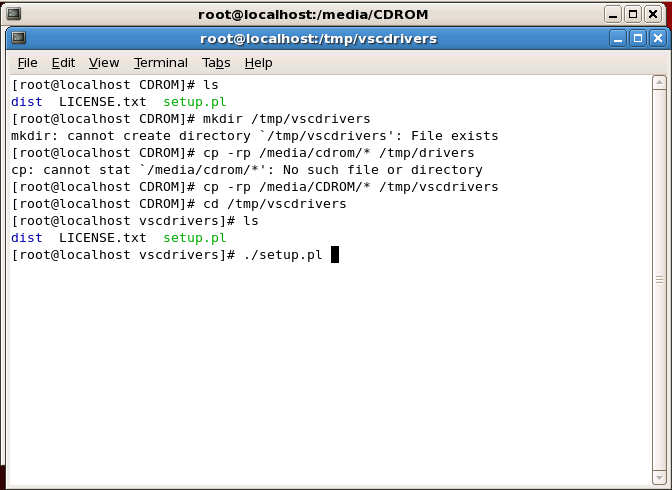 As the root user, run the following command to compile and install the synthetic drivers. A reboot is not required. That should do the trick. On GUI, Synthetic Mouse is not available but you can download from http://www.xen.org/download/satori.html .Before you install this driver, make sure you have install xorg-x11-server-sdk package.